#5 This item is one that was not necessarily odd as it was challenging. This object of art had to be crated and was transported by one of our most senior art handlers, Mitch, from Naples, FL to Orange County, CA. 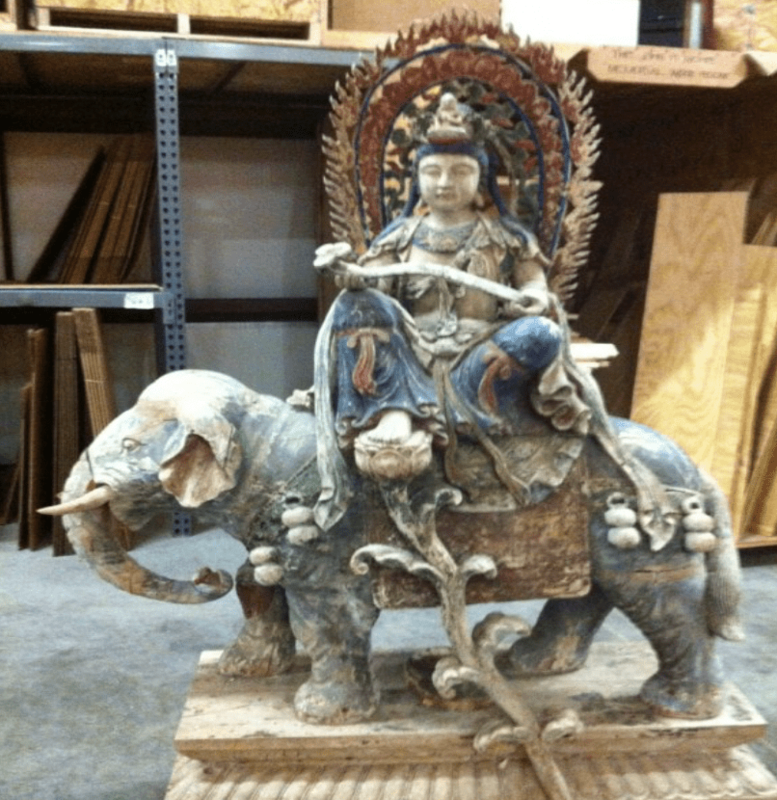 It was an ancient wooden, hand carved, ceremonial elephant. We were not sure of the date that this had been carved but, it likely was over 500 years old. Everything on it was still original. Many parts had had some repairs and much of the original paint was still on it. It was large, extremely heavy, very fragile and definitely one of a kind. Needless to say, we were a bit nervous to be entrusted with this great piece. We did get it to its destination in perfect condition and the homeowner was thrilled. #4 An 8 foot long, 4 foot wide hand carved and crafted wooden clock. 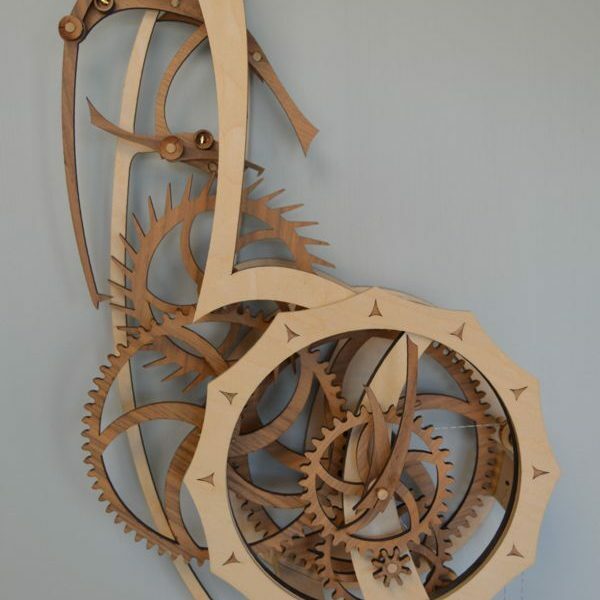 This clock was a working piece of artwork that even the gears were entirely made of wood. The sculptor, of course, had made this and brought it to the home owner and assembled it, piece by piece, at the house. Our task was to remove it from the wall completely assembled, aside from the hands and a few easily removable pieces, crate it and move it from Massachusetts to Naples, FL. Again, one our most trusted art handlers, Italo, was able to carefully crate and transport this beautiful sculpture to its final destination without incident. 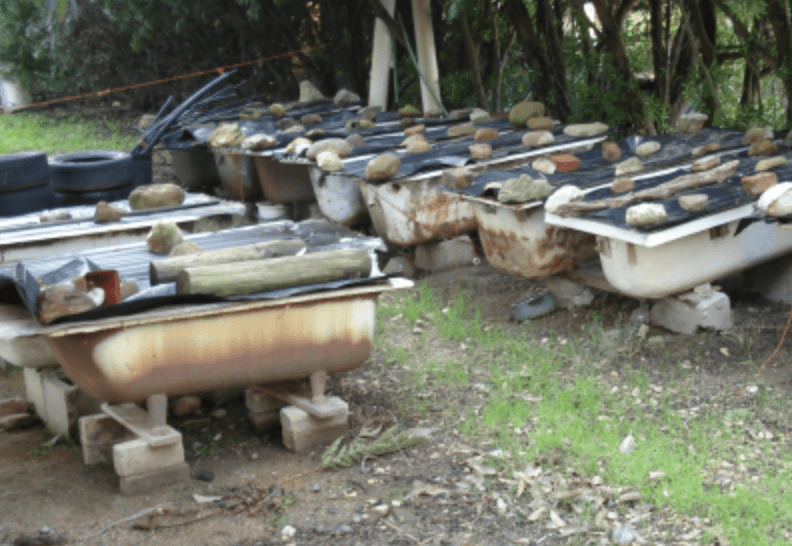 #3 An Earthworm Farm. In the early days of taking over the William C Huff Moving company from Mr. Huff himself, there was an expectation from previous clients that we could move “anything” so, for a few long years I begrudgingly, did move some off the shelf items. While touring a house for its up-coming move, the homeowner, while in the basement of this Dover, NH home, pointed a large wooden, shallow box that was on wooden legs. She asked if we would have any problem moving their “worm farm”. She quickly explained that the earthworms eat organic food scraps, paper and other “trash” and turn them into fertilizer. She explained that the worms were definitely not harmful to anything and she just didn’t have a vehicle big enough to transport them in. 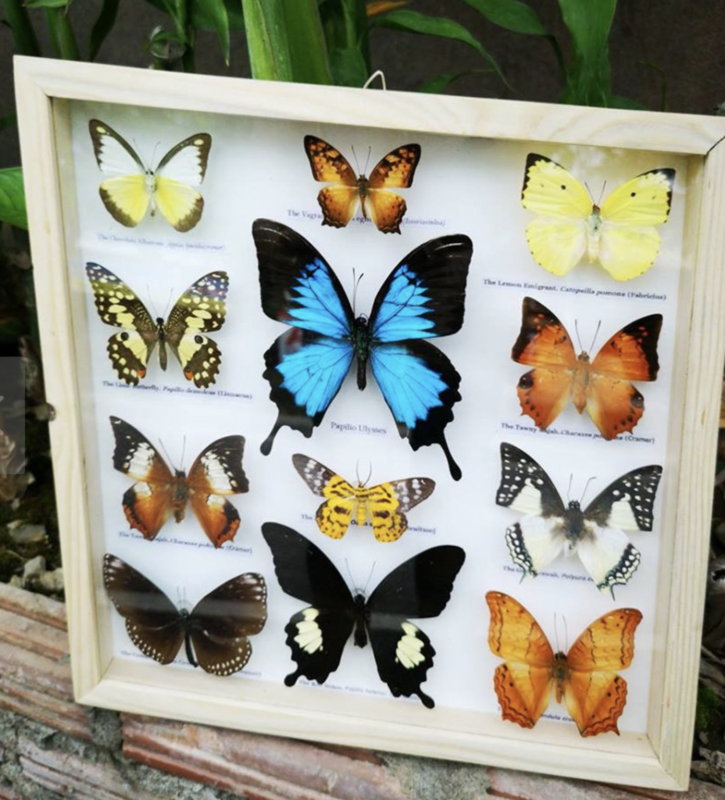 #2 World’s most rare butterfly collection. I believe we had had the William C Huff Company for about 15 years when a retired missionary from our local church, who had spent 40 years in the jungles of Brazil, asked if we could transport his butterfly collection to the University of Florida’s butterfly museum. I did some research and found out that UF was one of the top butterfly research facilities in the world. Of course we agreed and made sure that these delicate creatures, which were already boxed and sealed, before we crated and packed them even more, for their trip from NH to FL. As fate has it, a few years later my daughter got accepted to play soccer at the University of Florida (and be a student). On one of our many visits to Gainesville we decide to visit the museum and take a look at these butterflies that we had transported. Much to our dismay, the curator of the collection informed us that that collection, the rarest in world, would not be available for public viewing for several more years as they had yet to classify many of the unknown species that our friend had collected. #1 A full grown (and still warm) NH MOOSE!!! Yes, my all-time favorite story is one where I encountered what was my largest roadkill of all time. Early one fall morning, as I was driving the few miles from my home to our Barrington, NH warehouse I noticed a very large, dark object lying in the breakdown lane of the highway leading to my office. Since it was still pitch-dark out I couldn’t make out what it was. Pulling over, I walked back to get a closer look, only to find out that it was at least a 6 foot tall male moose, lying dead in the road. Cautiously I approached the beast and sort of poked it with my foot. It didn’t move so I carefully put my hand on the back of his neck, only to find out that he was still warm but, not breathing. I quickly called the local police who were on the scene in just a few minutes, followed by two local boys in a pick-up truck who were going to move this creature off the road. As I watched the two burly men hopelessly try to budge this 1200 pound behemoth I quickly drove the short driveway to my warehouse where I met my warehouse manager Josh, warming up the forklift in anticipation of the day’s workload. I briefly explained to him that we needed him to drive out to the end of the driveway and help get a dead moose out of the road. As it was only 5:30 am and Josh had only had a ½ cup of coffee and I am sure he thought I was pranking him. None the less, he turned on the forklift lights and the two of us sped down the long driveway out to the highway. After a few expletives of disbelief from Josh, we carefully maneuvered the forks under the dead animal and with 4 of us, we were able to roll the massive body onto the forks. Josh easily lifted the animal with the lift, drove over to the pick-up truck and we lowered him into the truck bed. As soon as the full weight was on the truck frame, it practically broke all the springs in the truck. 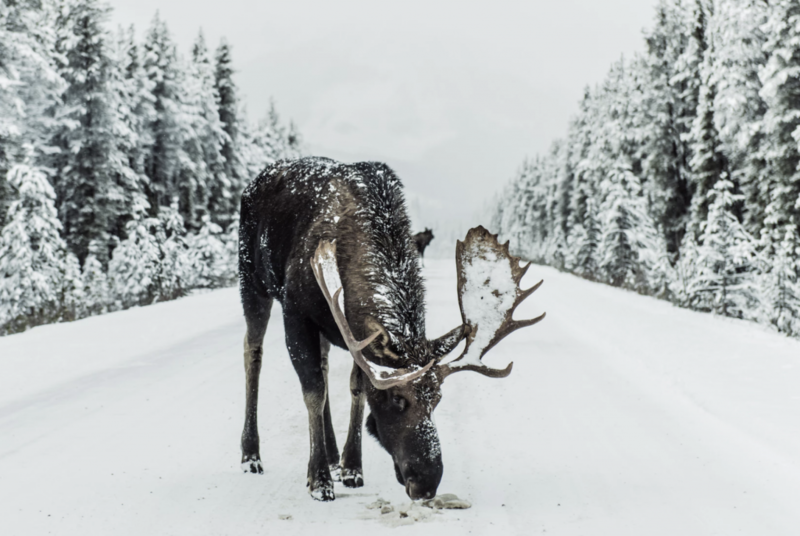 The two men hopped into the truck and lumbered down the road with what we were certain to be many hundreds of pounds of moose burgers in their freezer. Not to miss out on the possible PR for this, I sent some pictures to the local newspaper and suggested a tag line “Local moving company moves anything…even a dead moose”. They gladly did the story but said (out of respect and interests of animal rights activists) they couldn’t put the picture of the moose in the paper. I don’t know where those pictures went but, they were definitely classic pictures and, told the story of how the William C Huff Company has moved pretty much anything, over the years.